All week long I had no concerns whatsoever about this. No sweat. I got this. As I parked my car though……my stomach knotted. Bam. Just like that. All the nerves that I SHOULD have been stuck with all week flooded me at once. And since I am so damn early, all I can do is sit here and gnaw on the worry. And tell you about it in an effort to deflect a bit. Ugh. I feel like a green kid all over again. An Epic Battle on The Living Room Rug. Lego-Style. The Narrator and I dug into my old Legos, and decided to make one large castle out of some of the many sets I used to have. We worked for several days building towers, dungeons, a throne room, and all kinds of neat little things. In fact, even with the events that are to be chronicled below, I don’t know if it is done yet. We may keep building. The Narrator is poised for his first Lego battle, and it would prove to be one of epic proportions. Here, the King sits in his throne room, and is about to find out that his castle is under attack. From pirates! ….and, also from what appears to be a smattering of his own men too? Who knows. War is hell. The brave King orders his main gate to be thrown open, and orders an attack on the invading hoard. His Majesty bravely engages the Pirate Captain in a struggle whose outcome was not only undecided, but inconsequential. In the fray, men are lost. The fallen look so peaceful. Their fight is at an end. Quickly, the small prison cell is filled to capacity with enemy POWs. The resourceful knights and their soldier allies (who played literally NO part in the actual fight) improvise, and the stable is cleared of horses and turned into a makeshift dungeon. The chaos is so intense, that not only are the enemy combatants not disarmed, but a few of the good guys ended up in there too. They’re all laying down because combat is exhausting. Outside, the battle rages on brutally. Its horrors nearly incomprehensible. The dragons are called, wreaking havoc on the Pirate army. Not all of the King’s troops are seasoned veterans though. Some are still trying to figure out the rudiments of their weaponry. And some are less than thrilled at the prospect of fighting with swords against an enemy armed with guns and flee the line. ….In every battle, there’s always that one guy who enjoys himself too much and makes everything weird and uncomfortable for everyone. Oh, great. That guy brought his pet dragon along. Of course, not ALL the participants are willing combatants. Some managed to find a few barrels of wine, and decided to settle their differences in a much more fun manner. Some pause to wonder, just exactly what the hell they’re doing there. In the end… Pirate and knight alike, their fate is all the same. Staged in the dungeon before ending up back in the bucket. Here, Mini-Me is seen taking a keen interest in the battle. Discord is his middle name after all. Between finishing the castle and staging the battle, we played with Lego for quite a long time. For The Narrator, it was fun. For me, it was like going back in time. He was me when I was his age. I was my father, sitting on the blue carpet in our living room, painstakingly following the directions for the newest castle my parents had gotten me for my birthday or Christmas. Lego was a massive part of my childhood. 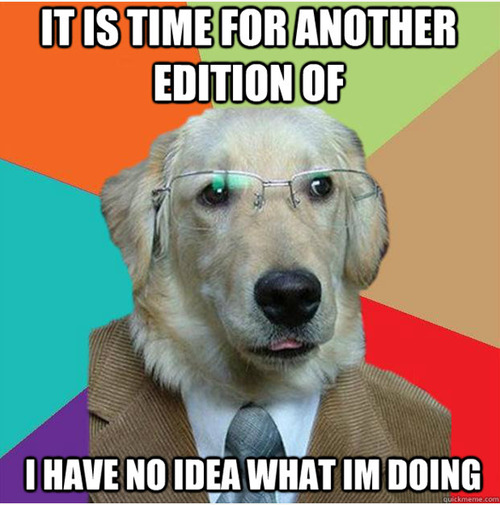 And now that it seems to be a significant piece of The Narrator’s….it hasn’t exactly escaped my adulthood. Several weeks back I got called to a house for a criminal mischief complaint. A guy had had a window in the back of his house smashed in. When I arrived, he told me nothing had been stolen, but the window had clearly been broken from the outside. I looked at the window and was surprised to find feathers in the glass. I played my flashlight around a bit and found the carcass of a Ruffed Grouse underneath the window, behind a woodpile. The bird had slammed into the window as such speed that it had shattered the glass, blew the screen frame into the house, and broke its neck. This would have been interesting enough, had it not happened again yesterday. Different house. My partner had gotten called by a guy doing property maintenance at a house who reported a window broken, it looked like someone had tried to break into the place. When she got there, a quick investigation found exactly the same thing. A dead Grouse under the window, with an added bonus of a second one on the floor inside the house. I remember several years back a buddy and I were driving down the road in his truck. It was summer, and I had my right arm out the window and hand down on the side of the door. As we clipped along we heard a “THUD!” and there were feathers everywhere. It turns out, not one, but two of these birds had come flying from the woods on the side of the road and crashed into the side of the truck- side by side, and killed themselves. There was a chip in the paint on the door, not three inches from where my hand had rested. I had assumed years back, that the two birds flying into the side of the truck was a strange fluke. These two cases logged into our blotter now of actual property damage had me doing some research this morning, and apparently, these birds are prone to something literally called ‘Crazy Flight’ which nobody seems to have a solid explanation for, but these birds can fly at speeds as high as 20 miles an hour while they’re doing it. Imagine a bird the size of a chicken flying 20 miles an hour at a window….you’re probably going to think someone tried to break into your house upon first inspection, and there’s going to be significant damage to whatever it hits. Weirdly, my research finds that this is a fairly common thing with these birds…except it’s usually associated with the fall and winter months. All three of my instances that I can account for have happened in the spring/summer. Different explanations are being offered to explain the phenomenon, from stomach worms, to juvenile idiocy, to being spooked by something- which if this is the case, that is absolutely, hands-down, the worst self-defense strategy in the natural world. 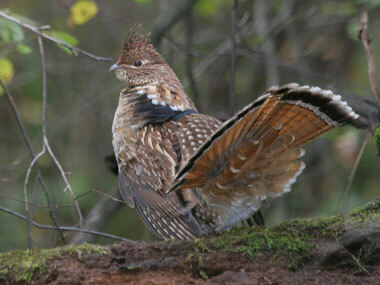 Ruffed Grouse are absolutely beautiful game birds, and I love hunting them. They’re a unique challenge in that its an active hunt, so you’re trying to flush them out of trees and underbrush. When you do, they take off quickly and with a drumming sound that will make your heart skip a beat if you’re not anticipating it. Merely getting a shot off sometimes is a challenge, and hitting them as they fly is something else entirely. I can’t figure out how come they can be so evasive when I try to hunt them, but in the space of a month, I can account for three of them dead as a result of kamikaze attacks on people’s houses. Regardless of why it happens, it is mind, and generally window-blowing when it does. At any rate, we have two cases on file of forced entry into homes where the offender ends up dead. *First off: I know what you’re thinking. No, I absolutely did not zap my kids. A thousand internet shames for you if that’s the first place your mind went. One of the good things about living in the district where I work, is that I can drop home from time to time while I’m driving around. If things aren’t horribly busy, I can grab a quick bite to eat at the house and save a few bucks. At the very least I try to get home for even a few fleeting minutes to see The Narrator once he gets home from school. If I had a long shift the night before, I’ll sleep right up to the point where he gets on the bus, I’ll get to say a hasty good-bye to him, pack him off to school, and be off to work before gets home. So if I don’t get back for a little bit, I won’t see him at least until the next morning, and I don’t really care for that idea. One day, I came back right around dinner time. Mini-Me has a fascination with all the gizmos on my belt, and I have to watch him or he’ll sneak around behind me and unsnap the handcuff case or turn on the flashlight. One day, he toddles up to me and is looking intently at the X26 (taser) on my belt. To give them an idea, I dug up a few training videos from youtube- the ones where recruits are zapped a bit, and not the swear-laden field videos of actual deployments. The boys seemed to get the picture, and that was the end of it. So you know how little kids will sometime pantomime ‘gun fingers’ when they’re playing? The thumb and index finger in an ‘L’ shape? Well, my two year old doesn’t do that. ……I am doing literally everything wrong. Brain Not Work. Make Fire. What in the name of every deity that has ever been worshiped since the dawn of the concept of religion has gotten into people? Our state has, for over a month now- been advertising a ‘burn ban’ as they always do this time of year. Essentially, when it gets dry but still is windy, the conditions become perfect for brush fires. Apparently, there are a number of people who must believe that this ban applies to everyone but them. Some joker downstate was burning brush and managed to create a 2,400 acre forest fire that has firefighters from all over the state responding to it. It’s been near a week and they’re ALMOST finished containing it. Our little area yesterday had two separate brush fires which were started again- by some dumbass whose capacity for thought is smaller than his capacity for calamity. A small one was taken care of pretty quickly, and a larger one that spread over 100 acres and required manpower and equipment from all over the county to contain. My department got called out to assist, but I was working PD so I could only watch mournfully as the trucks rolled off the floor. They were on scene for around 8 hours with dozens of other firefighters containing it as it spread into state forest land. NYS lifted the ban on motorized vehicles for the park to allow people with ATVs to get into the woods and put a lid on it. …..I know the weather is nice, but exactly how cretinous do you need to be to not realize what you’re getting into by having a cook fire (which is not covered by the ban) with flames 8 feet high? These people are burning the brush and limbs which had been torn from the trees over the winter, and calling it a ‘cook fire’ when authorities show up. Even the legitimate cooking fires are fairly foolish. Why take a chance? Use the damn grill and wait a few weeks would you? But no. Rules and laws have a magical way of not applying to those who really should be obeying them most. My point today, I suppose is merely to rant about people with no sense of what is not only right and wrong, but what is a good idea vs. a bad idea. ….I guess I should be grateful on some level. They keep me employed. Use your noodles readers…..if the conditions aren’t right, or there’s a ban in place…don’t burn anything outside. Or I’m going to send Smokey the Bear to your house to gnaw on your limbs. Fitbit Thinks Actual Work Is Sleepy Time. My wife knows my love of gadgetry. For my birthday this year, she bought me a fitbit flex, the little bracelet thingy that measures your steps for the day, calories burned, time active, and so much more that I’m still figuring out. One of the cool things about it is the ability to put it into ‘sleep mode.’ Basically, you tap the bejezus out of it for a second or two to chance the mode, and it begins to measure your resting time. It gives a pretty good account of how much time you spend actually resting, how many times you wake up, and how much time you spend being restless. It really is a nifty little thing that I’ve gotten used to wearing for near on two weeks. The other day, when I was building the wooden frame for our new sub-panel upgrade, I was hammering in some finish nails to hold the wood panel to the frame itself. Fitbit vibrated, and when I looked at it, It had switched itself to sleep mode. “Dammit, fluke.” I thought and moved on. Yesterday though, while I was working on replacing some plywood panels near the floor at the front of the vanity, I was using a drill to put screws in. Again….vibrate. Sleep mode. Now, part of me thinks this is my own fault. Fitbit recommends wearing devices on non-dominant wrists. BUT…I tried that when I first got it, and my non-dominant hand is the one I have on the steering wheel most of the time when I’m driving, and the unit thought I had walked 6 or 8 times more steps than I actually did that day. I switched it, and the step counter seemed more accurate, but now actual work confuses it. We’re still figuring out the subtle nuances of the thing, but even if I can’t hash out the ‘hammer time = sleep time’ issue, it still gives me a rough sense of what I’m doing each day, and how I’m doing at night….that is….when I remember to put the damn thing in sleep mode on my own. It’s fun and giving me a pretty good glimpse into what goes on for me at a daily clip. Like I said, our relationship is a work in progress. Allergies? Sick? Either Way- Damn. The other day I noticed the onset of some symptoms that people who face allergies time of year complain of. Runny nose, congestion, and so forth. You see, not only have I never had seasonal allergies, but I’ve always been sort of a (good-natured of course) jerk-knuckle to those who have. You know, the sort of thing that makes one unbearable to be around while you’re suffering. My wife, who DOES suffer from seasonal allergies and who has threatened to liquidate my existence if I continued my ridicule, immediately turned the tables on me. …and so forth, with the sort of loving support that one gets from a spouse when dealing with physical agony. About ready to cave and admit that I have, for all these years- been something of a jerk now that I had joined the ranks of the seasonal-allergy sufferers, more symptoms arrived. It turns out I have a spring-time cold and NOT allergies. This is not cause for celebration. Springtime colds have a tendency to be worse than the wintertime ones as far as I’m concerned. Plus, when you get sick in the spring, everyone else who is happy and healthy and enjoying the wonderful weather has a tendency to pick on you when you’re down for the count. It really is very rude and wholly unnecessary. So here I sit, about ready to go to work tonight with my head rapidly and constantly filling with mucus, and a cough that seems to choose the most inopportune times to manifest itself, like when I get of the car for a traffic stop, or am on the phone with dispatch…fun and exciting times that make my job so very much more difficult to do. I did get out and mow the lawn today and while I was out there, the symptoms of my cold seemed to fade for a while and I was able to get the work done without feeling like I was going to pass away. This has happened before too. I remember one time I went out to cut the grass with one hell of a hangover, and came back in feeling like a million bucks. I am starting to firmly believe that the outdoors is as much a medication for what ails you as anything you might get in a grocery store. ….unless of course you have allergies…then you’re pretty much boned. In my time in the working world, before entering ‘career land,’ I did many things, from roofing and landscaping to vacuuming out port-o-johns and ski lift operator. While not doing any of it long enough to achieve ‘expert’ status, I have managed to pick up enough skill to get through basic handy-man jobs. One thing though, that I never, ever worked with, was electricity. Even basic electrical work is above me. Hell, I get sweaty changing the batteries in the TV remote. So when the house we are renting- a 1970s modular, started to have some minor electrical problems, I got nervous. I’d flip a breaker here and there, but that was all I was willing to try. …Now, when I say ‘minor’ issues, I mean nothing more than the act of running the dryer would blow the entire sub panel and plunge the whole house into darkness. Nothing huge right? My wife disagreed. Apparently after two years of hanging laundry to air dry, trips to the laundromat, and very gingerly trying the dryer now and then, I was given a choice. Fix the dryer and the electricity issue, or Fix the dryer and the electricity issue. As handy as I always liked to think I am, my brother makes me look like a moron. He’s a certified carpenter, mason, and heavy equipment operator with the army, and is apprenticing with a master electrician in his civilian life. So I called him. One look at the sub panel and he knew the whole thing had to be replaced. Fuses that arent even made anymore would pop from their housing with the slightest touch. So he did some work on it and promised to come back in a few days to change the panel. After he left….our hot water went away. Back he came, fiddled some more, and nothing. We drained the hot water tank, changed the heating elements, refilled it….and nothing. Finally he said “Screw it.” I met him at a local home improvement store, laid out a hundred bucks worth of equipment, and he changed the panel. Now we are a fully operational household again for the first time in…well, a while. Hot water, dryer, and an electrical sub-panel that is no longer a fire trap or mouse portal. As a bonus, I got to play a bit too. The new panel box is considerably larger than the old one, so I had to build a new wooden frame around it to enclose everything. One less thing on the “Honey-do” list, and a much happier wife.